Helicopters, trains, buses, and airport shuttle vans provide fast transportation from Monaco, Monte Carlo, and Menton to Nice-Côte d’Azur Airport (NCE). Getting to Aéroport Nice-Côte d’Azur (NCE) from Monaco is fastest by helicopter, most sensible by airport express bus or train, and cheapest by bus. Taxis and pre-booked airport shuttle van services are convenient for groups and families. Travel times from Nice-Côte d’Azur Airport (NCE) to Monaco without any waiting are: 7 minutes by helicopter, 45 minutes by Express Bus 110 or car, 50 minutes by train and bus, and up to two hours on regular buses. 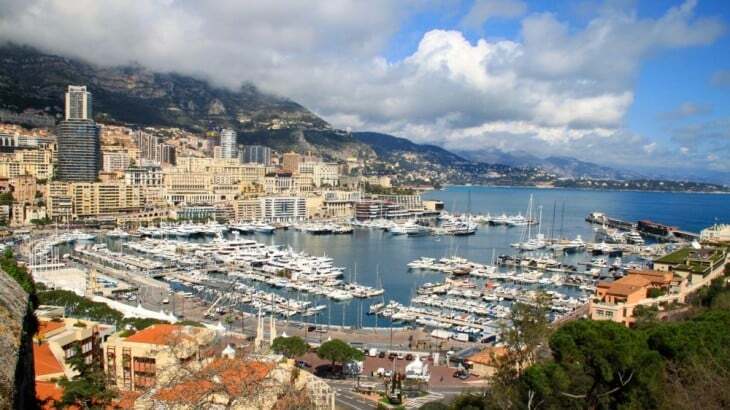 Taxis from Nice-Côte d’Azur Airport (NCE) to Monaco is by the meter but should be around €90, making it a good alternative to the bus for small groups, families, or when traveling at odd hours. Pre-booked airport shuttles and limousines may work out slightly cheaper. Taxi2Airport and Suntransfers give online quotations for private airport transfers without first requiring personal details or flight numbers. Around 70 daily scheduled (and more private) helicopter transfers speed travelers between Monaco and Nice-Côte d’Azur Airport (NCE). The seven-minute flight is definitely the fastest and most glamorous way to arrive in Monaco from Nice Airport. Helicopter flights from Nice-Côte d’Azur Airport (NCE) to Monaco Heliport (MCM) cost around €160 per person on a scheduled flight with discounts for children, over-65s, and return flights. 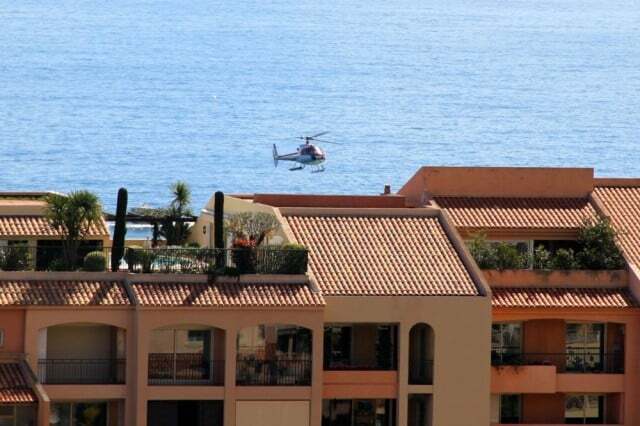 The helicopters arrived at the heliport in Fontvieille at the far western side of Monaco but usually include the road transfer to the final destination in Monaco. Private flights, with up to five passengers, are just shy of €1000 for the transfer between Monaco and Nice-Côte d’Azur Airport (NCE). Travelers on a budget should note that the Monaco to Nice flights are generally €10 cheaper than the other direction. During the Formula 1 Grand Prix weekend all prices go up. Solo travelers may find Airport Xpress Bus 110 the best value when traveling between Monaco and Nice-Côte d’Azur Airport (NCE). The bus uses the highway with limited stops to reach Monaco in around 45 minutes with one bus per hour continuing all the way to Menton in 1h15. The one-way fare is €22 or €33 for an open return. Children under 12 pay €5. Under-26s pay €16.50 while a group of four adults can travel for €66. Luggage carry a surcharge of up to €5 per bag – first two bags free. Express bus 110 departs twice per hour from Nice-Côte d’Azur Airport (NCE) from 8:45 to 21:15. The earliest possible arrivals at the airport are 6:30 on weekdays and 7:20 on weekends. The last bus arrives at the airport at 20:25. Tickets for the Express bus 110 can be bought from the ticket window at the airport, the bus driver, or online. Seat reservations are not possible. For travel outside these hours, use bus 100 from Nice-Le Port (dead slow but cheap at €1.50) or more sensibly the train. 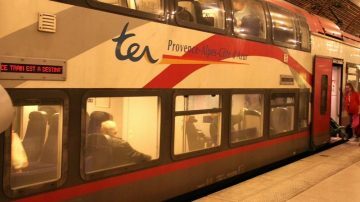 Trains provide a viable alternative to the Express Bus 110 when traveling between Monaco and Nice-Côte d’Azur Airport (NCE). Two basic options are available from Monaco Station: travel to Nice-Ville station (€3.90) and transfer to bus 99 (€6) to Nice Airport, or stay on the train until Nice-St Augustin station (€5) and then walk 15 minutes to Terminal 1. See Travel to Nice Côte d’Azur Airport by Train for more details. French train tickets are available for print at home from the official websites of French Railways – Oui.SNCF and RailEurope, or from the much simpler to use Trainline. The cheapest way to travel between Monaco and Nice-Côte d’Azur Airport (NCE) is by regular bus. 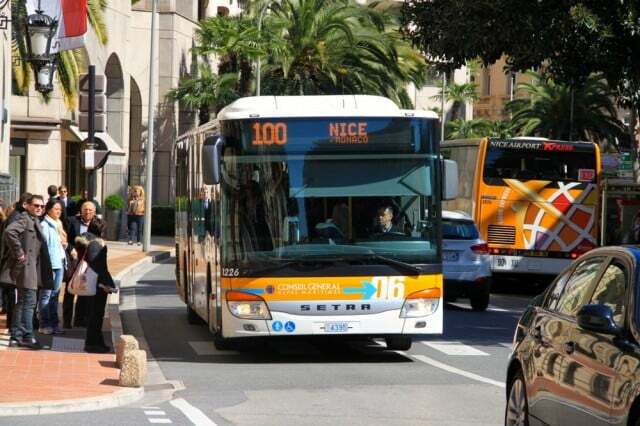 From Monaco use bus 100 to Nice (€1.50) that runs around four times per hour. Traveling time is around an hour but could be significantly longer in heavy traffic. In Nice, transfer to bus 23, 52, 59, or 70 (€1.50) or airport express bus 98 or 99 (€6) to the airport. Total travel time could be well over two hours and luggage is not very popular on these municipal buses. On bus 100, €1 is charged for a second piece of hand luggage and €5 for a suitcase. N100 NocTAM’bus night buses departs from Terminal 1 on Thursday, Friday, and Saturday nights at 22:00, 23:30, 1:00 and 2:30 for Monaco and Menton. N100 buses for the airport leaves Menton on the sames nights at 23:15, 0:45, 2:15 and 3:45 and pass through Monaco just less than half an hour later. Traveling time from the airport at night is around 40 minutes to Monaco and just over an hour to Menton. See Travel to Nice-Côte d’Azur Airport (NCE) by Public Bus for more details.